Is employee empowerment always the answer? Different types of work call for different types of engagement. Should open leaders always aim for empowerment? Before we jump on the employee empowerment bandwagon, we should explore the important connections between empowerment and innovation. That requires placing empowerment in context. As Allison Matlack has already demonstrated, employee investment in an organization's mission and activities—and employee autonomy relative to those things—can take several forms, from "managed" to "enabled" to "empowered." Sometimes, complete and total empowerment isn't the most desirable type of investment an open leader would like to activate in a contributor. Projects are always changing. New challenges are always arising. As a result, the type or degree of involvement leaders can expect in different situations is always shifting. "Managed," "enabled," and "empowered," contributors exist simultaneously and dynamically, depending on the work they're performing (and that work's desired outcomes). So before we head down to the community center to win a game of buzzword bingo, let's examine the different types of work, how they function, and how they contribute to the overall innovation of a company. 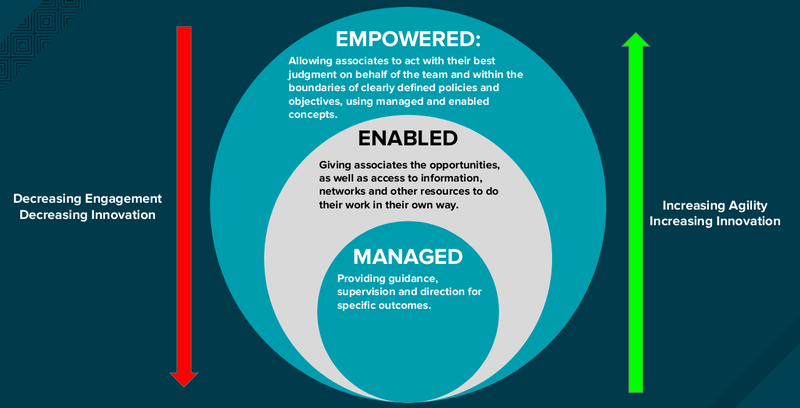 Let's refine what we mean by "managed," "enabled," and "empowered" work, and discuss why we need all three. First, let's consider and define each type of work activity. "Managed" work involves tasks that are coordinated using guidance, supervision, and direction in order to achieve specific outcomes. When someone works to coordinate every part of every task, we colloquially call that behavior "micro-managing." "Enabled" associates have the ability to direct themselves while working within boundaries (guidance), and they have access to the materials and resources (information, people, technologies, etc.) they require to problem-solve as they see fit. Lastly, "empowered" individuals direct themselves within organizational limits, have access materials and resources, and also have the authority to represent their team or organization and make decisions about work on behalf using their best judgement, based on the former elements. Most important here is the idea that these concepts are nested (see Figure 1). Because each level builds on the one before it, one cannot have the full benefit of "empowered" associates without also having clear guidance and direction ("managed"), and transparency of information and resources ("enabled"). What changes from level to level is the amount of managed or enabled activity that comes before it. Let's dive more deeply into the nature of those activities and discuss the roles leaders should play in each. "Managed" work is just that: work activity supervised and directed to some degree. The amount of management occurring in a situation is dynamic and depends on the activity itself. For instance, in the manufacturing economy, managed work is prominent. I'll call this "widget" work, the point of which is producing a widget the same way, every time. People need to perform this work according to consistent processes with consistent, standardized outcomes. Because this work requires consistency, it typically proceeds via explicit guidelines and policies (rules about cost, schedule, quality, quantity, process, and so on—characteristics applicable to all work to a greater or lesser degree). We can find examples of it in a variety of roles across many industries. Quite often, any role in any industry requires some amount of this type of work. Examples include manufacturing precision machine parts, answering a customer support case within a specified timeframe for contractual reasons and with a friendly greeting, etc. In the software industry, a role that's entirely like this would be a rarity, yet even these roles require some work of the "managed" type. For instance, consider the way a support engineer must respond to a case using a set of quality standards (friendliness, perhaps with a professional written tone, a branded signature line, adherence to a specific contractual agreement, usually responding within a particular time frame, etc.). "Management" is the best strategy when work requirements include adhering to a consistent schedule, process, and quality. As the amount of creativity a role requires increases, the amount of directed and "managed" work we find in that role decreases. Guidelines get broader, processes looser, schedules lengthened (I wish!). This is because what's required to "be creative" involves other types of work (and new degrees of transparency and authority along with them). Ron McFarland explains this in his article on adaptive leadership: Many challenges are ambiguous, as opposed to technical, and therefore require specific kinds of leadership. To take this idea one step further, we might say open leaders need to be adaptive to how they view and implement the different kinds of work on their teams or in their organizations. "Enabling" associates means growing their skills and knowledge so they can manage themselves. The foundation for this type of activity is information—access to it, sharing it, and opportunities to independently use it to complete work activity. This is the kind of work Peter Drucker was referring to when he coined the term "knowledge work." Enabled work liberates associates from the constraints of managed work, though it still involves leaders providing considerable direction and guidance. Outcomes of this work might be familiar and normalized, but the paths to achieving them are more open-ended than in managed work. Methods are more flexible and inclusive of individual preference and capability. "Enablement" is the best strategy when objectives are well-defined and the outcomes are aligned with past outcomes and results. In "Beyond Engagement," Allison describes empowerment as a state in which employees have "access to all the information, training, tools, and connections to people and others teams that they need to do their best work, as well as a safe environment in which to do that work so they feel comfortable making their own decisions." In other words, empowerment is enablement with the opportunity for associates to act using their own best judgment as it relates to shared understanding of team and organizational guidelines and objectives. "Empowerment" is the best strategy when objectives and methods for achieving them are unclear and creative flexibility is necessary for defining them. Often this work is focused on activities where problem definition and possible solutions (i.e. investigation, planning, and execution) are not well-defined. Any role in any organization involves these three types of work occurring at various moments and in various situations. No job requires just one. The labels "managed," enabled," and "empowered" apply to different work at different times, and all three are embedded in work activity at different times and in different tasks. That means leaders should be paying more attention to the work contributors are doing: the kind of work, its purpose, and its desired outcomes. We're now in a position to consider how innovation factors into this equation. Frequently, people discuss the different modes of work by way of contrast. Most language about them connotes negativity: managed work is "the worst," while empowered work is "the best." The goal of any leadership practice should be to "move people along the scale"—to create empowered contributors. Note here that the more enabled and empowered the work is, the more potential there is for creativity when doing that work. This is because creativity (and the creative individual) requires information—consistently updated and "fresh" sources of information—used in conjunction with individual judgment and capacity for interpreting how to use and combine that information to define problems, ideate, and solve problems. Enabled and empowered work can increase inclusivity—that is, draw more closely on an individual's unique skills, perspectives, and talents because, by definition, those kinds of work are less managed and more guided. Open leadership clearly supports hiring for diversity exactly for the reason that it makes inclusivity so much richer. The ambiguity that's characteristic of the challenges we face in modern workplaces means that the work we do is ripe with potential for innovation—if we embrace risk and adapt our leadership styles to liberate it. The more enabled and empowered the work is, the more potential for innovation. Focusing on the importance of enabled work and empowered work is not to devalue managed work in any way. I would say that managed work creates a stable foundation on which creative (enabled and empowered) work can blossom. Imagine if all the work we did was empowered; our organizations would be completely chaotic, undefined, and ambiguous. Organizations need a degree of managed work in order to ensure some direction, some understanding of priorities, and some definition of "quality." Any role in any organization involves these three types of work occurring at various moments and in various situations. No job requires just one. As open leaders, we must recognize that work isn't an all-or-nothing, one-type-of-work-alone equation. We have to get better at understanding work in these three different ways and using each one to the organization's advantage, depending on the situation. Empowering employees doesn't mean you won't need to manage them. But it does mean leaders need to think differently about their roles. Great article Heidi. I think in recent times, "Managed work" has gotten a bad name. This is probably for two reasons. 1-Too many managers want to be "the boss" and tell people what to do. If the employee is mainly in a training or development mode, taking directives is appropriate, but as the employee develops, continued directives could become counter-productive. 2-Today, with more creative, innovative environments due to more rapid change that we're going through, directives from the "boss" might not be very helpful unless he has a great deal of experience on the issue being worked on. You're sure right that good supervision and guidance still have important roles to play.